This is an excerpt from WE SHOULD ALL BE FEMINISTS by Chimamanda Ngozi Adichie. 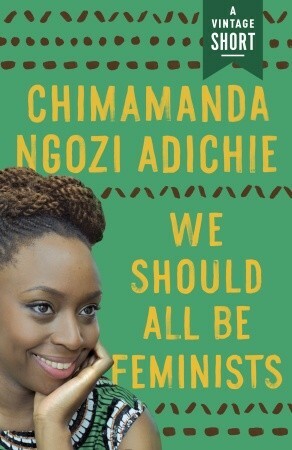 Copyright © 2012, 2014 by Chimamanda Ngozi Adichie. Reprinted by permission from Vintage Books, an imprint of the Knopf Doubleday Publishing Group, a division of Random House, Inc. The first time I taught a writing class in graduate school, I was worried. Not about the teaching material, because I was well prepared and I was teaching what I enjoyed. Instead I was worried about what to wear. I wanted to be taken seriously. I knew that because I was female, I would automatically have to prove my worth. And I was worried that if I looked too feminine, I would not be taken seriously. I really wanted to wear my shiny lip gloss and my girly skirt, but I decided not to. I wore a very serious, very manly, and very ugly suit. The sad truth of the matter is that when it comes to appearance, we start off with men as the standard, as the norm. Many of us think that the less feminine a woman appears, the more likely she is to be taken seriously. A man going to a business meeting doesn't wonder about being taken seriously based on what he is wearing—but a woman does. I wish I had not worn that ugly suit that day. Had I then the confidence I have now to be myself, my students would have benefited even more from my teaching. Because I would have been more comfortable and more fully and truly myself. I have chosen to no longer be apologetic for my femininity. And I want to be respected in all my femaleness. Because I deserve to be. I like politics and history and am happiest when having a good argument about ideas. I am girly. I am happily girly. I like high heels and trying on lipsticks. It's nice to be complimented by both men and women (although I have to be honest and say that I prefer the compliments of stylish women), but I often wear clothes that men don't like or don't "understand." I wear them because I like them and because I feel good in them. The "male gaze," as a shaper of my life's choices, is largely incidental. Gender is not an easy conversation to have. It makes people uncomfortable, sometimes even irritable. Both men and women are resistant to talk about gender, or are quick to dismiss the problems of gender. Because thinking of changing the status quo is always uncomfortable. Some people ask: "Why the word feminist? Why not just say you are a believer in human rights, or something like that?" Because that would be dishonest. Feminism is, of course, part of human rights in general - but to choose to use the vague expression human rights is to deny the specific and particular problem of gender. It would be a way of pretending that it was not women who have, for centuries, been excluded. It would be a way of denying that the problem of gender targets women. That the problem was not about being human, but specifically about being a female human. For centuries, the world divided human beings into two groups and then proceeded to exclude and oppress one group. It is only fair that the solution to the problem acknowledge that. Some men feel threatened by the idea of feminism. This comes, I think, from the insecurity triggered by how boys are brought up, how their sense of self-worth is diminished if they are not "naturally" in charge as men. We do a great disservice to boys in how we raise them. We stifle the humanity of boys. We define masculinity in a very narrow way. Masculinity is a hard, small cage, and we put boys inside this cage. We teach boys to be afraid of fear, of weakness, of vulnerability. We teach them to mask their true selves, because they have to be, in Nigerian-speak—a hard man. What if both boys and girls were raised not to link masculinity and money? What if their attitude was not "the boy has to pay," but rather, "whoever has more should pay." Of course, because of their historical advantage, it is mostly men who will have more today. But if we start raising children differently, then in fifty years, in a hundred years, boys will no longer have the pressure of proving their masculinity by material means. But by far the worst thing we do to males—by making them feel they have to be hard—is that we leave them with very fragile egos. The harder a man feels compelled to be, the weaker his ego is. And then we do a much greater disservice to girls, because we raise them to cater to the fragile egos of males. We teach girls to shrink themselves, to make themselves smaller. We say to girls: You can have ambition, but not too much. You should aim to be successful but not too successful, otherwise you will threaten the man. If you are the breadwinner in your relationship with a man, pretend that you are not, especially in public, otherwise you will emasculate him. 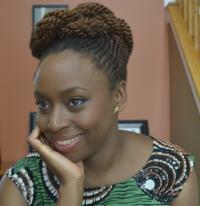 Chimamanda Ngozi Adichie grew up in Nigeria. Her work has been translated into thirty languages and has appeared in various publications, including The New Yorker, Granta, The O. Henry Prize Stories, the Financial Times, and Zoetrope: All-Story. She is the author of the novels Purple Hibiscus, which won the Commonwealth Writers' Prize and the Hurston/Wright Legacy Award; Half of a Yellow Sun, which won the Orange Prize and was a National Book Critics Circle Award Finalist, a New York Times Notable Book, and a People and Black Issues Book Review Best Book of the Year; Americanah, which won the National Book Critics Circle Award and was a New York Times, Washington Post, Chicago Tribune, and Entertainment Weekly Best Book of the Year; and the story collection The Thing Around Your Neck. A recipient of a MacArthur Fellowship, she divides her time between the United States and Nigeria. Her novel, Half of a Yellow Sun, was recently adapted into a movie directed by Biyi Bandele and starring Chiwetel Ejiofor; and Americanah was just optioned for film by Academy Award-winner Lupita Nyong'o.